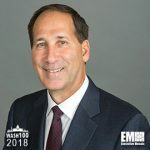 Executive Mosaic is pleased to announce Alphonse Whitmore, BAE Systems’ president of its intelligence and security sector, has been inducted into the 2018 edition of the Wash100 — Executive Mosaic’s annual selection of the most influential voices in the government contracting arena — for excellence in delivering information technology and communications services to government clients. Whitmore was a key player in BAE’s potential three-year, $37 million contract win on Feb. 5th, meant to address obsolescence for the U.S. Air Force‘s aircraft, weapons systems, equipment and electronic components. The company will utilize its web-based advanced component obsolescence management platform to monitor and predict when parts used in those systems become obsolete, in keeping with the branch’s drive to reduce sustainment costs. Work on the project will ooccur at BAE’s locations in Florida, Georgia, Oklahoma and Utah. “Al brings more than three decades of experience delivering information technology and communications services to government and commercial customers,” said chief executive officer Jerry DeMuro when Whitmore joined BAE last year. “His deep understanding of this highly competitive market will enable him to build on the tremendous success that the [I&S] team has provided in support of the customers’ critical military and national security missions,” he added. Before BAE, Whitmore held senior leadership positions at General Dynamics IT division and GTE’s government solutions, before its 1999 purchase by the former company. While working at GDIT, he oversaw the unit’s investment strategy for core technologies, market expansion efforts and mentoring program. He also co-led RGNext, a joint venture between GD and Raytheon which secured a major contract with the Air Force’s space program valued at over $1 billion. Whitmore sits on the board of directors for the Armed Forces Communications and Electronics Association. He is an executive committee member. Executive Mosaic congratulates Al Whitmore and his BAE I&S team for receiving this award.